This program is an easy to follow step-by-step guide to financial independence that works...as thousands of students prove every single day. Many first-time investors think they don�t have enough cash for a down payment. The truth is: You don�t need a down payment to buy real estate. The secret to buying property with no money down is to find flexible sellers and apply creative financing solutions. In my course, I go into great detail showing you how to do both. 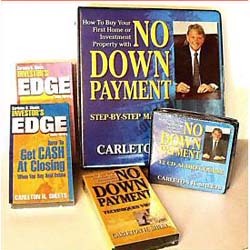 With your help we can reach more people and let them know about Carleton Sheets, No Down Payment System whether this product works or not. What a Scam this is!!!! This program is a joke. You will lose money if you buy this and it does not work and you'll likely go bankrupt if you do. Don't buy this.